It's time to blog hop again, actually it was time to blog hop... I should have posted this nearly two days back. I have been so lame in blogging these days, I have to push my self to post something. So here I'm posting late for Blog Hop Wednesday by Radhika. This week I have been paired with a wonderful blogger Nisha of Nisha's Kitchen. She has a wonderful collection of recipes, after battling between between few recipes, finally I made up mind with this Sprouts Sandwich. This easy peasy rolls are ready in minutes if you have some ready made tortillas and sprouts on hands. I tweaked the original recipe a tiny bit by using some ketchup to spread in the tortilla and skipped the sev part since I couldn't get some. You can find the original recipe here. 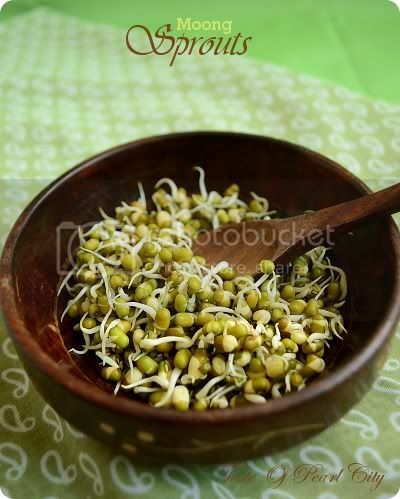 To see how to make sprouts click here. Heat oil in a pan, add the chopped onion, tomato and saute for a minute or two. Then add the grated carrot, sprouts, chat masala and salt. Quickly give it a stir and remove it from heat. Take a tortilla and heat it slightly in a pan, spread a thin layer of ketchup, place a spoonfull of filling in the middle. Roll it tightly, cut into half and serve it immediately. If you couldn't find tortillas, you can also use chappathi's. Instead of ketchup you can use mayonnaise or any other spread which you favour. This recipe is linked with Blog Hop Wednesdays, check out what our other Blog Hoppers have been doing this week. 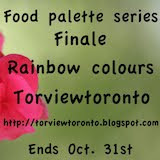 Also this recipe goes to Food Palette Series- rainbow colours and Life is Green. V healthy & delicious ......I can have them anytime. I really love sprouts - they add so much flavour. These wraps look great!! I love to grab one. Very healthy version and no doubt it fits well for evening snacks !!! such a healthy sandwich looks wonderful..
A wonderful healthy sandwich. Something I’d love to eat any time. 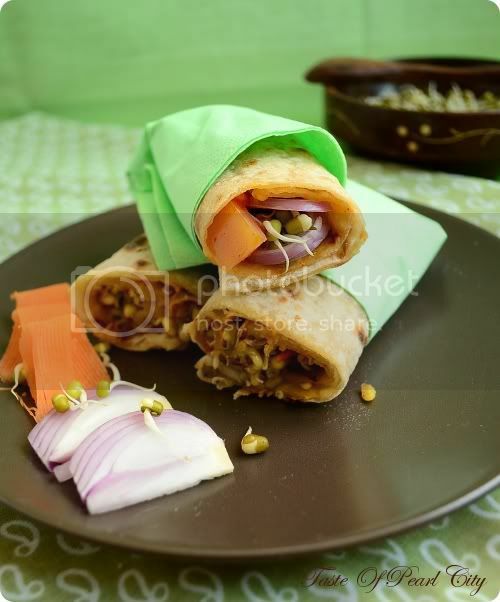 very tempting and healthy...loved it..
sprouts in a wrap look so good!!! wonderful healthy lunch recipe! Loooks yummy and lovely presen tation!!!! Simple & healthy wraps!!! And ayeesha...sure do miss your posts theze days!!! Love the presenation! I'm off to Helsinki tmr, courtesy of Finnair! I'm gonna miss all your posts while I'm away. Be sure to drop by if u miss me too much! Take care, dear! Healthy and protein rich wraps, marvellous..
What a healthy and delicious wraps! !I wud love to try it! 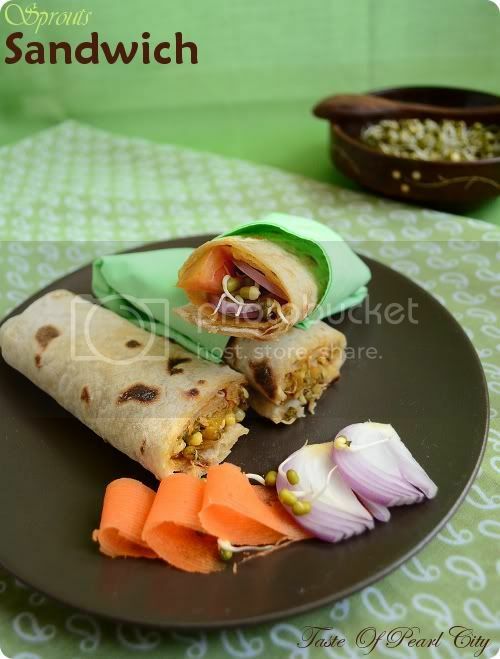 Hi Ayeesha!,sandwich roll luks yumm,luvly and healthy.It can serve U any meal.Thanks for sharing. interesting and healthy one too! Love the sprouts filling any day!! delicious. Love it . Can you link it to my event Fast food not fat food? i love sandwiches using tortillas and yours looks easy enuf for me to try! thanks for the wonderful recipe! such a healthy n delicious wrap!! I'm glad I hopped by from another blog because your sprouts sandwiches are so nicely made and look really delicious! Healthy, delicious and so beautifully presented! Love it! mmm... very healthy, nutritious and delicious looking sandwich. sandwich looks very healthy and tempting.. love the green background and the presentation. Great collection and greater pics. Keep up the good work. All the best.